2, a small demo of the ship customizer. At first, we designed the combat to have a goal, with the player needing to dodge bullets to retain health and earn credits from kills in order to buy ship upgrades. However, after just a few hours at PAX, we decided that making the player invulnerable and removing the goals was WAY more fun. Our idea of how big the demo needed to be for PAX was overestimated; people would drop by for a couple of minutes and really just want to fly around and shoot stuff. Dying wasn't so fun, and earning credits to upgrade parts was definitely out of the scope of what a short demo needed. So, what we ended up with was a super simple dogfighter! The player had a certain amount of friendlies and an equal amount of enemies that would constantly respawn, and there was no final goal. Players could fly around and shoot the enemies, with a couple extra fun controls: pushing down the right stick would allow the player to spawn new friendlies and enemies, and the up and down buttons on the D-Pad allowed controlling friendlies. Up would tell the friendlies to go kill whatever enemy the player was locked on to, then return to the player; down would tell friendlies to find any random target, kill it, and then return to the player. Friendlies spawned with the right stick would follow the player in sphereical formation. In addition, the game had a small ship customizer demo. The customizer allowed you to pick from the three fighter classes I've written so far (surreal, classic, and tie-like) and customize the shape and size of the wings and hull of the ship, as well as a couple of details like the surface detailing and overall warps. The full version will allow you to do much more, but this demo was in the small scope of what people would play with during their short stop at our PAX booth. Josh also added the ability to randomize a color pattern on the ship, which was cool and well-received. In short: really well! 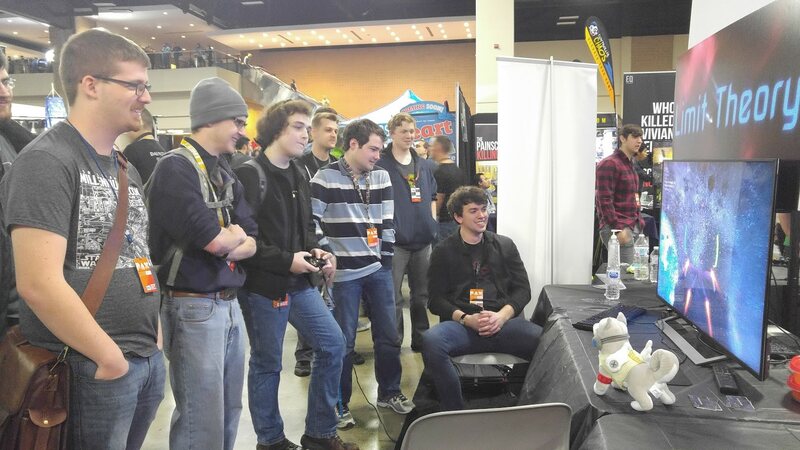 We had a constant stream of visitors to the booth with almost no downtime, and virtually everybody who played enjoyed it. We ran out of the 300 business cards we printed. People really enjoyed the dogfighting, and while fewer people used the ship customizer, those that did deeply enjoyed it and said things like "I could play with this all day!" Josh made small tweaks to the code throughout PAX, sometimes to implement or change a feature (like when we made players invulnerable), to fix a small bug (of which we had very few), or to make a change a player asked for. One of our biggest requests, for example, was to make the control axes inverted, which we're certainly going to take note of. 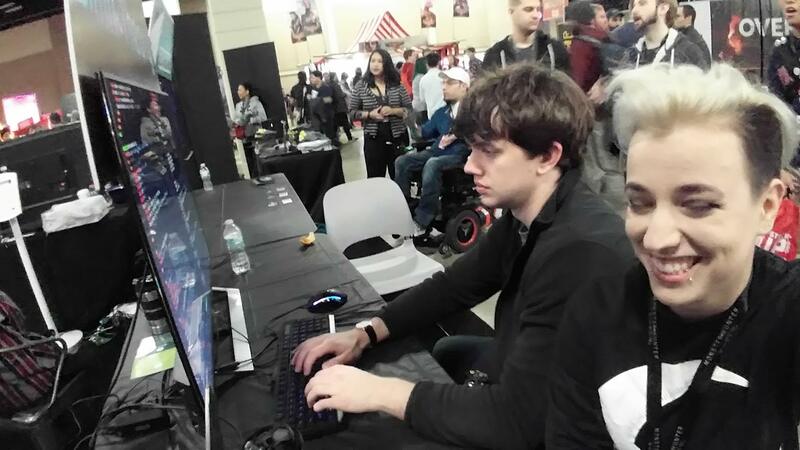 Overall, PAX was a great experience for us, both in marketing and for testing the game. We made real connections with fans old and new, from backers, to people who had heard about the game a couple of years ago, to people who were learning about it for the first time. The demo was also great test of our workflow for writing gameplay code and of our performance. We found a few things to clean up with regards to architecture that Josh and Adam are now working on. We're very, very close to going full-force on gameplay code, and the PAX demo was a great milestone for that. 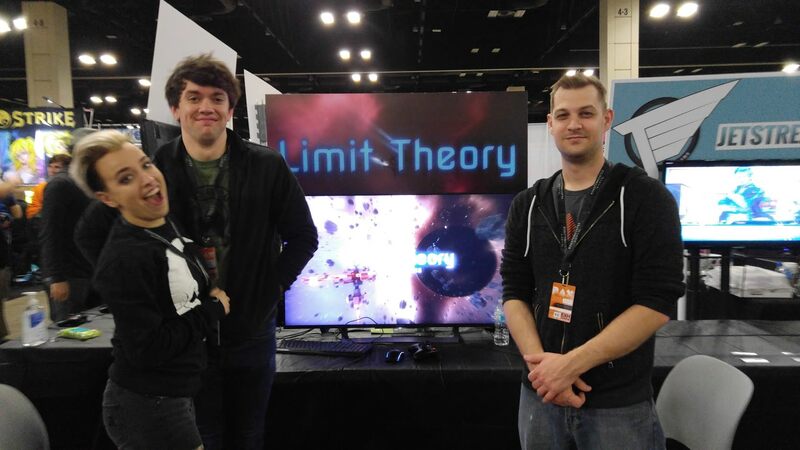 Here are a couple of photos of the team in front of our booth. That's all, folks! I hope this has satiated your curiosity about what went on at PAX. Here's the link to the demo video again. Feel free to ask more questions about what was in the demo and such, and thank you always for your continued support. Last edited by LindseyReid on Thu Jan 18, 2018 4:48 pm, edited 2 times in total. I'm blown away with the new vid.. just had to let you know Lindsey, Adam and the ever wonderful Josh. If you guys are at PAX next year, I am so going to be there.. with my gopro! Last edited by FormalMoss on Thu Jan 18, 2018 3:59 pm, edited 1 time in total. Awesome to see the whole team and a demo. Great job! Pats on the back all around! I can’t wait to hopefully have my dream of a drone/robot space pirate fleet. @Josh: Have you tried locking the HUD to the pivot rotation of the ship? or at least having it (HUD) follow along with the pivot rotation to a certain degree? This is superb stuff, Lindsey. Thank you very much! I too had forgotten what Josh looked like. *chuckle* It was a treat to see both the video footage and the photos especially the one of the team smiling. 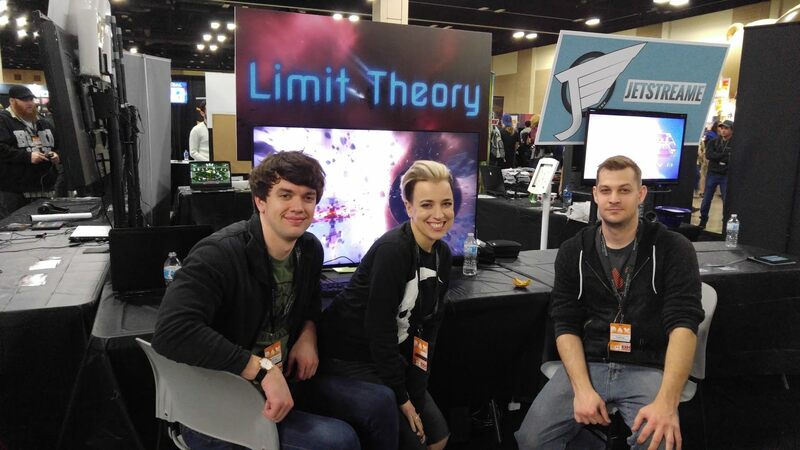 I'm so pleased it all went well for Limit Theory. Don't quite understand what you mean -- can you clarify? Like, having some sort of roll indicator on the HUD that shows you your relative orientation with respect to the ecliptic plane? Or like the whole HUD sort of acts more like a physical projected screen in front of the ship such that it is subject to the camera<->ship relative orientation? Great update! The pictures are great, too! We saw a tiny bit of it from a Twitch streamer, but it's nice to have a better behind-the-scenes look. When the ships starts "rolling" (@1:37) the HUD (and by that i mean the 2 curved vertical bars, not the stats in the upper right) stays fixed straight ahead. It "feels" like there is a disconnect between the motion of the ship model and the HUD itself. Does that make it more clear? Not to sound like your Mom, Josh, but you need some of that good wholesome soup and some fresh air. I think I see what you're saying, but to be honest, if the HUD was tied to the rotation of the ship, I would find that a lot more disorienting, personally. It looks fine to me the way it is. I can't speak for anyone else, obviously, but I think it'd throw me for a loop if it moved. That is where the second part of the first question comes in: or at least having it (HUD) follow along with the pivot rotation to a certain degree?